This round of boot spots is a good mix of old and new boots. 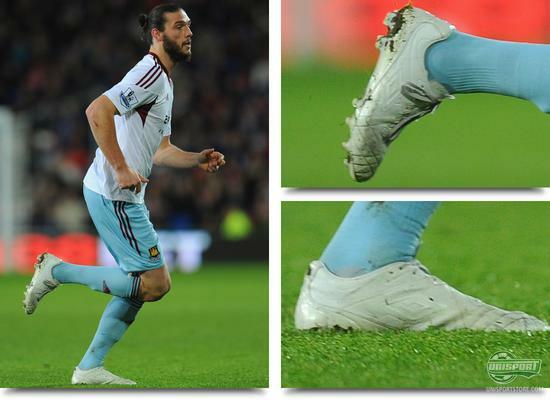 Some are wearing boots that haven't even been released yet, while others find it hard to leave their old football boots. We bring it all to you right here. There has been a lot of great football again over the weekend. With full rounds of football both in Italy, Spain and the Premier League, football Europe is very much waking up after the Christmas holidays. And based on the boots that the players are wearing, it looks like some have gotten new boots for Christmas, while others have not been as lucky. Raul Baena from Rayo Vallecano was very much displaying the Italian flag. Some might say that this is a little strange for a Spaniard to show off the Italian colours like this, but this is surely not something Baena is worried about. He was happily wearing the very special Stadio Potenza II, which was specially developed for the World Cup in Italy. Mario Balotelli (AC MILAN) Puma evoPOWER CAMO Super-Mario aka. 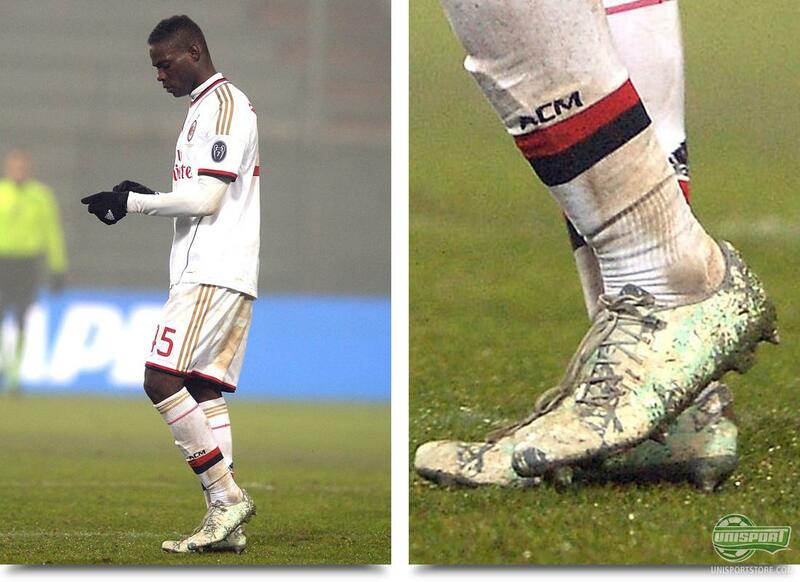 Mario Balotelli was, during the weekend, wearing the unique Puma evoPOWER CAMO, which are Pumas elegant way of hiding the new boot. It will, however, not be long before we will get to see the new evoPOWER  and we are looking forward! 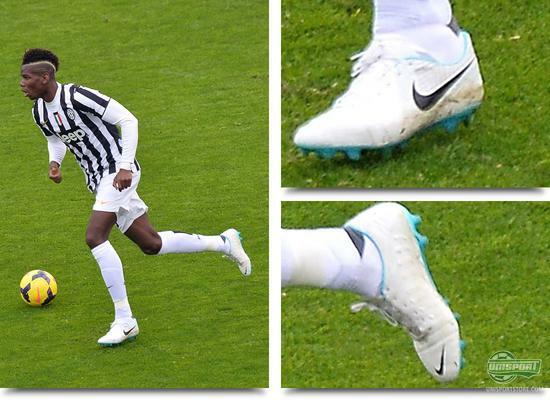 Poul Pogba (Juventus) Nike CTR 360 Maestri White/Black/Gamma Blue French midfielder Poul Pogba is among the lucky ones who have gotten new boots during Christmas. In the weekend he was wearing the elegant Nike CTR 360 Maestri III from Nike's Reflective Pack with the sharp combination of white and gamma blue including the reflective pattern. 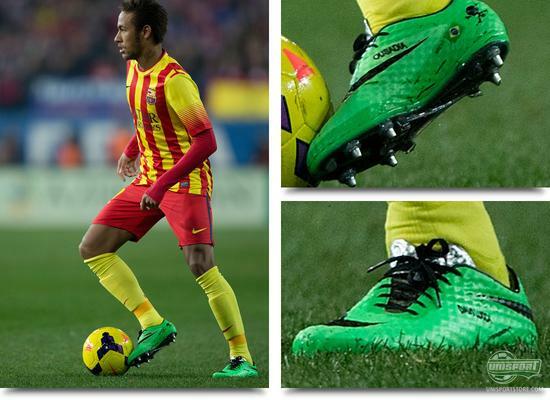 Neymar JR. (FC Barcelona) Nike Hypervenom Phantom Neo Lime/Black/Total Crimson The weekend provided us with a top clash as Atletico Madrid got a visit from FC Barcelona. Unfortunately the match ended without any goals, meaning that Neymar did not find the back of the net in his Nike Hypervenom Phantom in the elegant combination of neo lime and black from Nike's latest boot collection, the Energy Pack. 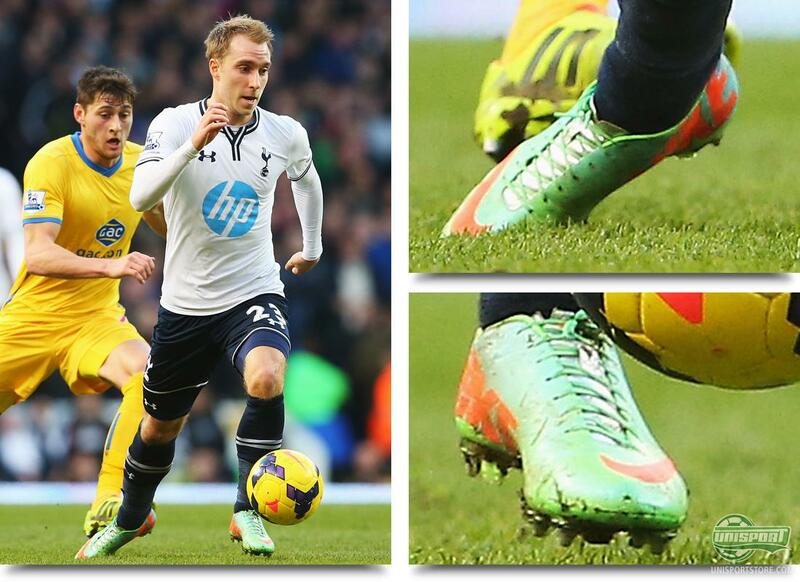 Christian Eriksen (Tottenham) Nike Mercurial Vapor IX Green/Blue Goals are, on the other hand, to be found at the feet of Danish Christian Eriksen. In Tottenhams comfortable 2-0 victory against Crystal Palace, the Dane did the business again in his new Nike Mercurial Vapor IX Green/Blue from the Energy Pack. It seems that Eriksen is in fine shape, something that we can hardly complain about coming from Denmark. Adam Lallana (Southampton) Puma evoSPEED Blue/Orange Right before Christmas, Puma put the lightning fast evoSPEED 1.2 on the street in a new colourway with a mix of blue/orange. 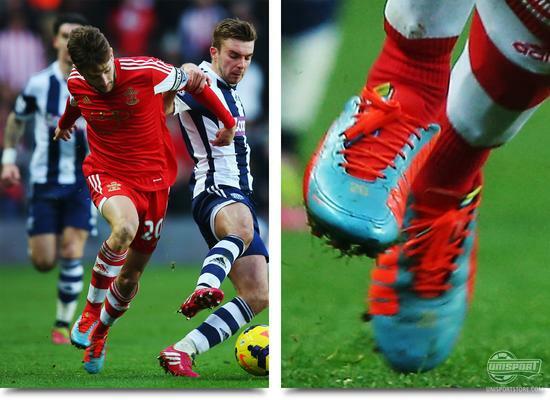 Very much to the liking of Adam Lallana it looks like, as he was wearing the sharp boot in the weekend match. Lallana has had a fantastic season so far, and he was also the man behind the important 1-0 victory against West Bromwich. 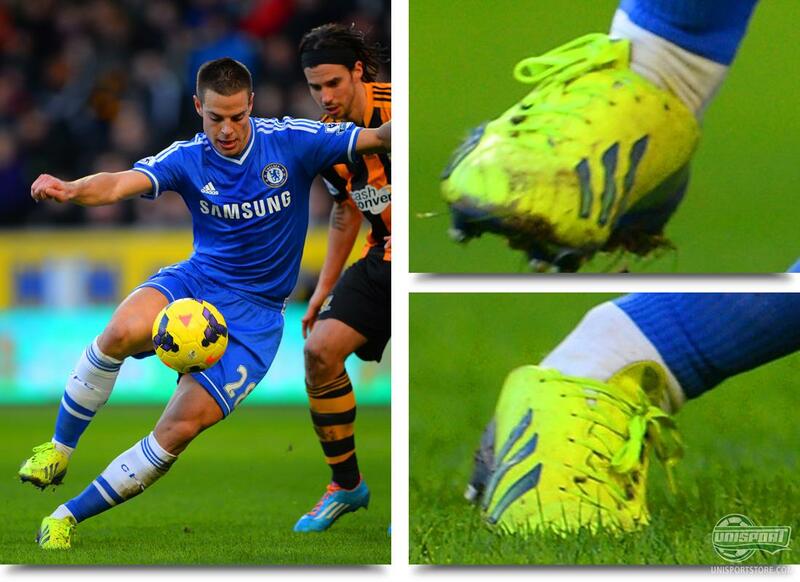 Cesar Azpilicueta (Chelsea) Adidas F50 Electricity/Hero Ink/Metallic Silver Although a lot of Adidas' faithful Adizero players have made the switch to the latest generation of the lightweight boot, it seems that Cesar Azpilicueta finds it a little hard to make the switch. He was faithful to the previous generation of the Adidas F50 Adizero, which had an upper of Sprintskin. Maybe Azpilicueta prefer this over the thin Hybridtouch material. Andy Carroll (West Ham) Umbro Speciali 4 Whiteout Andy Carroll has, for some time now, been one of Umbro's strongest actives, and in the weekend he was wearing a pair of Umbro Speciali 4 in all white. 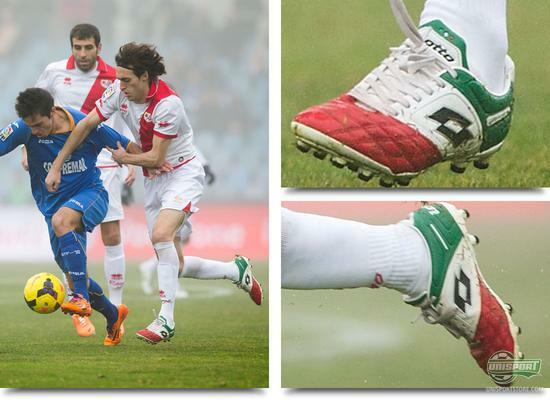 White football boots are always elegant to look at, and that is certainly also the case for these whiteout boots. 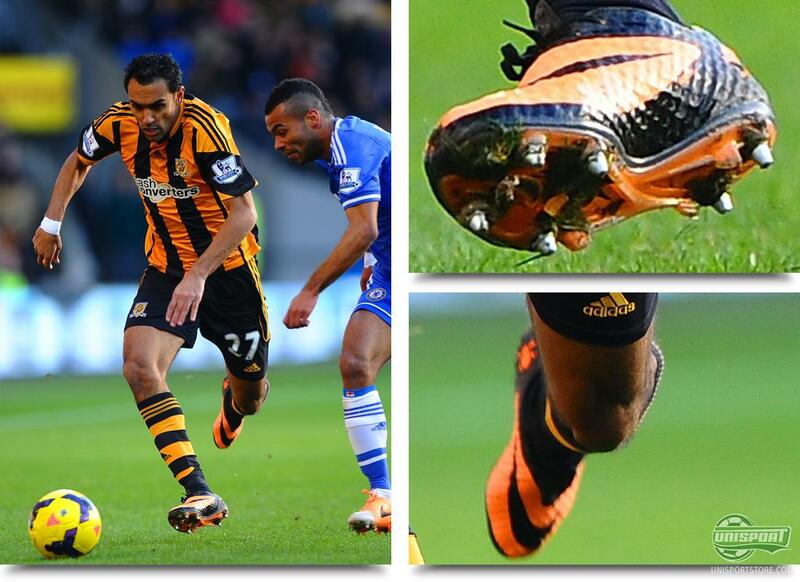 Ahmed Elmohamady (Hull) Nike Hypervenom Phantom Black/Bright Citrus Since the Nike Hypervenom saw the light of day back in June of last year we have seen the boot in numerous exciting colourways. Although the options have been a plenty, it doesn't look to have impressed Ahmed Elmohamady from Hull; certainly not as much as the Black/Bright Citrus, which he was wearing. Kevin-Prince Boateng (Schalke 04) Nike Hypervenom Phantom Blue/Black Some people wear new football boots, and then there are people who wear football boots that have not even been revealed yet. 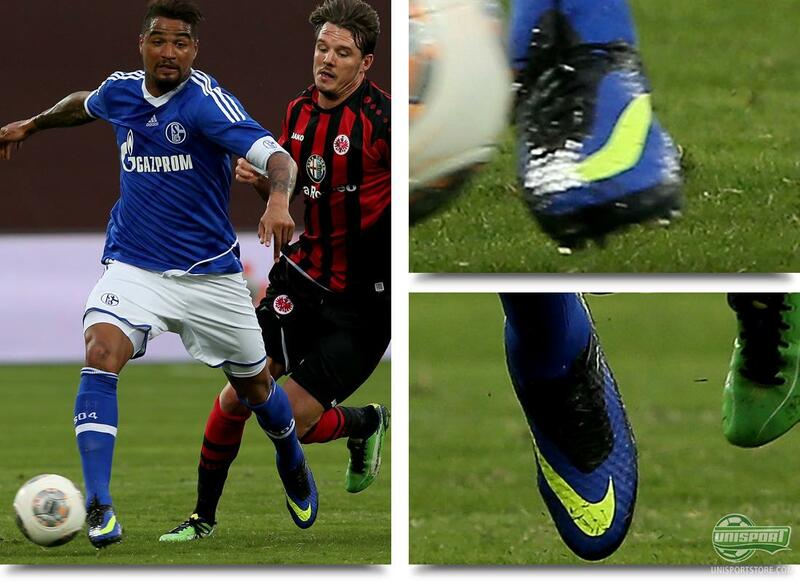 Schalke 04 player Kevin-Prince Boateng is to be found in the last category. Lately we have seen numerous players wearing the new colourway for the Nike Hypervenom Phantom, and it shall be interesting when Nike puts out more information. There are lots of new football boots and lots of old football boots in this round of boot spots. What boots have you spotted over the weekend? And what was your top highlight? Feel free to leave a comment here, or on Facebook and Twitter.